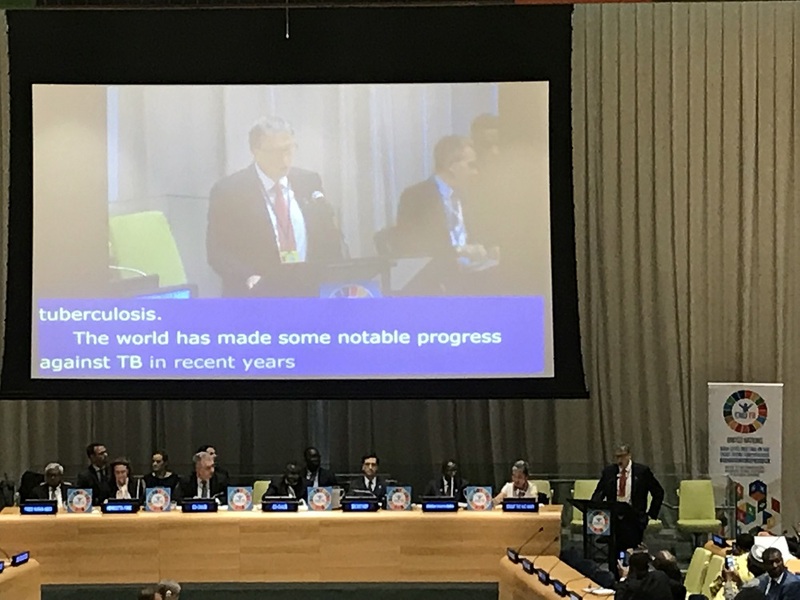 NEW YORK — World leaders and senior representatives came together today for the first-ever High-Level Meeting on the Fight to End Tuberculosis at United Nations headquarters in New York. At the meeting, heads of state adopted a political declaration with commitments to accelerate action and funding to end the tuberculosis epidemic by 2030. In her opening statement, María Fernanda Espinosa Garcés of Ecuador, president of the General Assembly of the United Nations, noted that ending TB is both a “moral responsibility and a political responsibility,” and that TB is “not egalitarian” in its impact, as it primarily affects the poorest and most marginalized communities. The political declaration [pdf] was previously negotiated by member states (IPW, IP & Health, 18 Sept 2018), and today was formally adopted at the well-attended high-level meeting. The declaration sets targets to treat 40 million people with TB from 2018 to 2022 and includes commitments to advance research on drugs and diagnostics, to promote access and equitable delivery of these tools, and to mobilize sufficient and sustainable financing for action to end the TB epidemic. “Heads of state and government attending this first-ever UN High-level meeting on TB agreed to mobilize US$ 13 billion a year by 2022 to implement TB prevention and care, and US$ 2 billion for research. They committed to take firm action against drug-resistant forms of the disease; build accountability and to prioritize human rights issues such as the stigma that still prevails around TB in many parts of the world,” the World Health Organization said in a release. A global debate over intellectual property and access to affordable medicines was a key issue in the lead-up to the high-level meeting (IPW, United Nations, 18 September 2018), and according to participants continued into the meeting today with several delegations making reference to IP rights. After adopting the political declaration on TB at the start of the meeting, Garcés called on heads of state to “move from words to deeds.” Lucica Ditiu, executive director of Stop TB Partnership, a key body mentioned in the declaration, told Health Policy Watch recently that the final document is sufficient in terms of its targets, but it could be stronger on accountability and access to medicines. The partnership co-hosted a private sector TB Innovation Summit a few days before on 23 September, see details here. Bill Gates, business luminary and founder of the Bill and Melinda Gates Foundation, gave the keynote address during the first multi-stakeholder panel of the meeting, noting that there has been progress. “Countries have tripled the number of TB patients since 2000,” he said. Yet Gates also highlighted a major challenge, that some 40 percent of people with TB still remain undiagnosed. He noted that better tools are needed, including drug and regimen development, as well as new rapid diagnosis tests that are affordable. “The private sector has the skills to play a key role in this effort, particularly pharmaceutical companies,” Gates said. He also called for increased engagement with private sector health providers, as a key strategy to expand access to diagnosis and treatment. Gates stated that the Gates Foundation “is committed to claim their part” in the fight against TB, particularly through continued partnership and funding through the Geneva-based Global Fund for AIDS, Tuberculosis, and Malaria. In his opening remarks, Dr Tedros noted that “the best way to protect [against TB] is to strengthen health systems and recommit to primary health care.” This has been a key theme throughout the high-level meeting on TB, particularly regarding its connection to recent calls for universal health coverage. Also during the panel, Khuat Thi Hai Oanh, executive director of Supporting Community Development Initiatives, noted that “maintaining the current efforts will not help to reach those patients that are hard to reach,” those that are “left behind” by current efforts. “People that are left behind with TB are also left behind in other health matters,” she said, reiterating the need for stronger primary health care systems to address TB and other health needs. 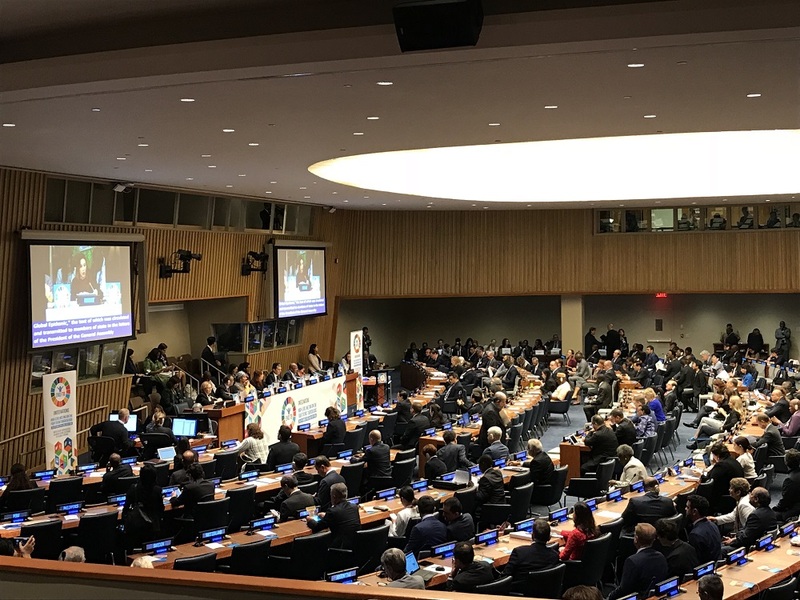 "World Leaders Commit To End Tuberculosis At Historic United Nations Meeting" by Intellectual Property Watch is licensed under a Creative Commons Attribution-NonCommercial-ShareAlike 4.0 International License.